This will see play in Rastakhans! Amazing entrance music/animation. Team5 has come long way since GvG. Half of the legendaries in that set didn't even have an animation. Hindsight is a wonderful thing. This was so promising, but no one counted on the meta going from Jade Druid vs Pirate Warrior vs Renolock to everyone jumping on the hyper aggro bus with Pirate Warrior, Quest Rogue, Burn Mage, and Aggro Druid. That being said, this is still the healthiest meta since pre-MSoG. 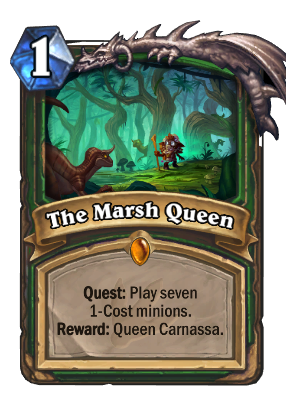 So maybe the next expansion could just not go overboard with attempts at balance, because that has always led to new extremes and missing out on interesting card potential, like this quest. Combo this with Brann and Elise for the "ultimate" fatigue deck, which is still a lot worse than jade druid..
so when are the tokens getting their golden animations and sounds on here? I was wrong as hell, it turns out the caverns below is the most cancerous tier 0 deck in the game. 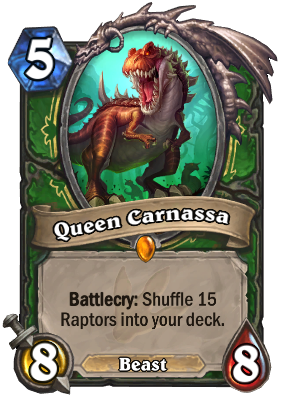 The raptors make you draw, so no, not fatigue hunter. It's padding your decks with 3/2s. 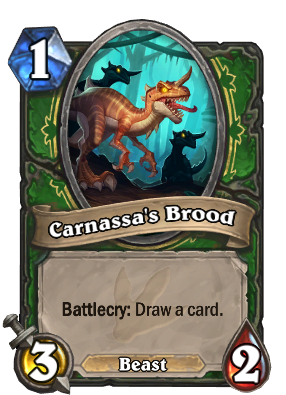 When you draw one, you play it for 1 mana and get your next card, so instead of drawing one card each turn like everyone else, you're getting one card and one or more raptors with it. And 15 more raptors to deal with also. Good luck! It might have been a control meta for the first time in history, if the people are Blizzard didn't decide to add this. Welcome to the new tier 0 ladies and gentlemen. Bunch of 1 drops, tracking, the new 5 mana draw 2 1-drops, starving buzzard, tundra rhino, and the quest.